As agreed at the first Treaty of Paris in 1814, a congress of the Great Powers of Europe met at Vienna to settle the future boundaries of the continent. Almost every state in Europe was represented. The emperors of Austria and Russia, the kings of Prussia, Denmark, Bavaria and Württemberg and many German princes including the Elector of Hesse, the Grand Duke of Baden and the dukes of Saxe-Weimar, Brunswick and Coburg, attended in person. Great Britain retained Malta, Heligoland, the protectorate of the Ionian Isles (the latter by a treaty signed 5 November 1815), Mauritius, Tobago and Santa Lucia from France, Ceylon and the Cape of Good Hope from Holland, Trinidad from Spain. Among its provisions; Belgium and Luxembourg unite with Holland to form the Netherlands, Switzerland is declared a neutral power, East Poland cedes to Russia and its western provinces to Prussia. Changes also affect Italy, Spain and Portugal. By the act of Confederation, signed 8 June 1815, and supplemented by the final act of Vienna, 15 May 1820, a German Confederacy was set up to replace the old Holy Roman Empire. The number of German states was reduced from over 300 to 39. A Diet was established under the Presidency of Austria, to which states were to send delegates. The Diet consisted of the Ordinary Assembly sitting permanently at Frankfurt and a General Assembly. Each state was to be independent in internal affairs, but war between the individual states was forbidden and the consent of the Confederacy was necessary for foreign war. Bavaria received Rhenish Bavaria, extending from the Prussian territory on the Rhine to Alsace, including the city of Mainz. Hanover became a kingdom and received East Frisia and Hildesheim. In Poland, Russia received the greater part of the grand duchy of Warsaw which was to be made into a separate kingdom of Poland. Krakow became a free city state under the protection of Russia, Austria and Prussia. Russia retained Finland, conquered from Sweden in 1808. Russia retained Bessarabia, taken from Turkey in 1812 . . . . The formation of the kingdom of the Netherlands was ratified, comprising the former republic of Holland and Austrian Belgium, under the former hereditary Stadtholder as King William I. The sovereignty of the Netherlands was given to the House of Orange, and the King of the Netherlands was made Grand Duke of Luxembourg, making him a member of the German Confederation. 1908 Meeting in the Baltic: King Edward VII of Britain meets Tsar Nicholas II of Russia on board the Royal Yacht anchored in the Baltic; the first meeting between a tsar and a British monarch. President Wilson sends the second note to the Germans, demanding an end to their procrastination over reparations for sinking the unarmed passenger ship. Wilson refuses to recognize the previously nonexistent 'war zone' set up by Germany around the British Isles. SD (Sicherheitsdienst des Reichsfuehrers-SS, Security Service of the SS), the SS's intelligence service and one of the major agents of the "Final Solution." The SD was created as the SS's intelligence service in 1931, and put under the command of Reinhard Heydrich. Its purpose was to expose enemies of the Nazi Party and keep them under observation. After Hitler brought the Nazi Party to national power in Germany in 1933, the SD was given official government responsibilities, such as creating and operating a widespread spy network among the German people. It reported on the activities of political and racial enemies of the Reich, mainly Jews, and kept Hitler informed of public opinion. In 1934 the SS took over the Gestapo, the Reich's secret political police. Soon thereafter, the SD was declared the party's exclusive intelligence service. However, the line between the two intelligence branches—the SD and the Gestapo—was quite blurry. The two agencies were headed by the same people and had similar responsibilities, namely, dealing with the "Jewish question." This did not prevent rivalry, however. Soon, SS chief Heinrich Himmler clarified the division of labor: the SD was to serve as an intelligence and counterintelligence service whose job was to identify state enemies; once they were exposed, the Gestapo would deal with those enemies. The SD also attempted to get into international espionage and military intelligence. Regarding the Jewish issues, the SD and Gestapo shared responsibilities. At the end of 1936 the SD's Jewish section adopted an official policy of ridding Germany of Jews. 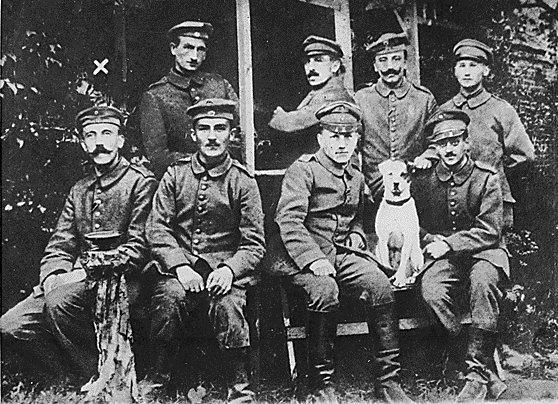 From then on, the SD harassed German Jews in order to get them to leave the country. The SD used confiscation of property, public pressure, and terror to achieve its goal. With the establishment of the Reich Security Main Office (Reichssicherheitshauptamt, RSHA) in 1939, SD functions were divided between two of the newly created offices. Certain individual staff members in other RSHA offices continued to be considered SD personnel. Many of them played a major part in planning and executing the "Final Solution." Many served in the Einsatzgruppen units that carried out the systematic mass murder of Jews in the Soviet Union in the summer of 1941. After the war, the SD was declared to be a criminal organization by the International Military Tribunal at Nuremberg, and its members subject to punishment as war criminals. 1935 Ho-Umezu Agreement: China, under KMT administration, recognizes Japanese occupations in Northeast China. Galeazzo Ciano was born in 1903. He held several diplomatic posts in Brazil, Argentina and China before marrying Edda Mussolini, the daughter of Benito Mussolini in 1930. In 1935 Mussolini appointed Ciano as Minister of Propaganda. The following year he became Minister of Foreign Affairs. Ciano was put in command of a bomber squadron and flew on several missions during the war against Ethiopia (1935-36). Ciano was a supporter of the alliance with Germany but objected to the way that Adolf Hitler ordered the invasion of Poland without consulting with Italy, as required by the terms of the treaty. Benito Mussolini followed Ciano's advice to keep out of the Second World War until the fall of France in May, 1940. In 1942 Ciano became increasingly dissatisfied with the way Benito Mussolini was running the country. After a series of heated arguments with Mussolini, Ciano resigned as foreign minister in February, 1943. Ciano remained a member of the Fascist Grand Council and argued that Italy should sign a separate peace with the Allies. He also voted for Mussolini to be replaced by Pietro Badoglio. Ciano left Rome after Mussolini's was overthrown but he was captured by the German Army. On the orders of Benito Mussolini Ciano was given a mock trial and was sentenced to a "traitor's" death—being shot in the back while tied to a chair on 11th January, 1944. 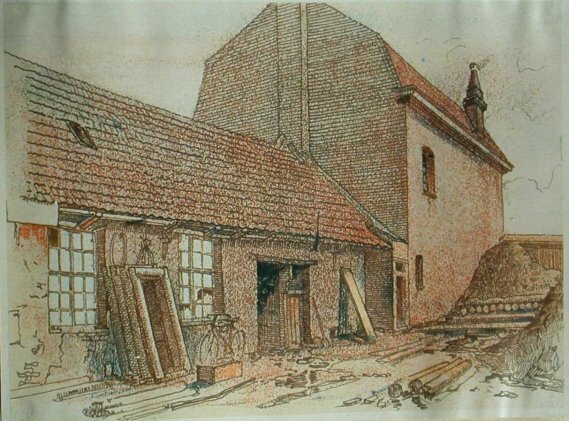 The demolition began on June 9; only a few days later the liberal synagogue in the Herzog-Max-Strasse, erected in 1887, was completely destroyed. With this event, the last chapter of the Nazi persecution began: only a few months later in the Pogrom night, both smaller orthodox Munich synagogues, Ohel Jacob and Reichenbachstrasse were destroyed, and shortly thereafter, the deportations to the death camps and the murder of most Munich Jews began. 1940 World War II: Norway: The German conquest is completed and the Allies withdraw their remaining troops. The King of Norway and his government order all Norwegian forces to cease fighting at midnight. My coming to England in this way is, as I realize, so unusual that nobody will easily understand it. I was confronted by a very hard decision. I do not think I could have arrived at my final choice [to fly to Britain] unless I had continually kept before my eyes the vision of an endless line of children's coffins with weeping mothers behind them, both English and German. Hitler's eulogy: I have only a few words to dedicate to this dead man. 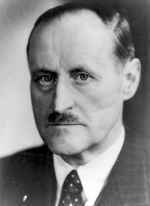 He was one of the best National Socialists, one of the strongest defenders of German Reich thought, one of the biggest opponents of all the enemies of the Reich. He fell as a martyr for the preservation and safeguarding of the Reich. As leader of the party and as leader of the German Reich, I give you, my dear comrade Heydrich, the highest recognition I have to bestow: the uppermost level of the German Order. After party comrade [Fritz] Todt, you are the second person to receive this award. World War II: The United States and Britain agree to pool all resources of food and production. On orders from my department, I too drove a gas-van from Berlin to Minsk. These vans had been constructed with a lockable cargo compartment, like a moving van . . . . I was detailed with the gas-van to about twelve convoys of arriving Jews. It was in 1942. There were about a thousand Jews in each convoy. With each arrival I made five or six trips with my van. Some of the Jews were shot. I myself never shot a single Jew; I only gassed them. General Sikorski, in a London speech, warns that the Jews of Poland "are doomed to destruction in accordance with Nazi pronouncements on destroying all Jews regardless of the outcome of the war." This state (Germany) is developing more and more into an immoral and bankrupt concern, led by an irresponsible gambler, who can himself hardly be considered mentally normal and who is surrounded by rabble. And so we roll towards the bottomless pit. No field marshal acts as a higher concept of duty would prompt. Even if he had no such inkling, the bare interest of the soldiers in survival and the simple military principle of waging war should suffice. Finland: Red Army invades Karelian Isthmus. According to the terms of the Treaty of Moscow of 1940, Finland was forced to surrender parts of its southeastern territory, including the Karelian Isthmus, to the Soviet Union, which was eager to create a buffer zone for Leningrad. To protect itself against further Russian encroachment, Finland allowed Germany to traverse its country in its push eastward into Russia, despite the fact that it did not have a formal alliance with the Axis power. Emboldened by the damage Germany was inflicting on Russia, Finland pursued the "War of Continuation" and won back large parts of the territory it had ceded to Moscow in the 1940 treaty. France: German troops recapture Tulle. 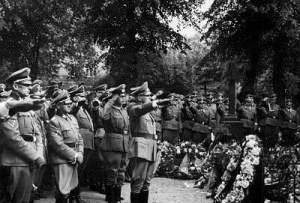 Waffen-SS soldiers find the bodies of 62 dead German soldiers, 20 others were never accounted for. In view of the 'Sperrle Orders' (see March 2), the SS soldiers hang 99 suspected partisans from lampposts and balconies. 1952 Death: Adolf Busch: German composer and violinist: In 1927, with the rise of Adolf Hitler, Busch decided he could not in good conscience stay in Germany, so he emigrated to Basel, Switzerland. (Busch was not Jewish and was quite popular in Germany, but firmly opposed Nazism from the beginning.) Upon the outbreak of World War II, Busch emigrated from Basel to the United States, where he eventually settled in Vermont. In a dramatic confrontation, Joseph Welch, special counsel for the U.S. Army, lashes out at Senator Joseph McCarthy during hearings on whether communism has infiltrated the U.S. armed forces. Welch's verbal assault marked the end of McCarthy's power during the anticommunist hysteria of the Red Scare in America. Senator McCarthy (R-Wisconsin) experienced a meteoric rise to fame and power in the U.S. Senate when he charged in February 1950 that "hundreds" of "known communists" were in the Department of State. In the years that followed, McCarthy became the acknowledged leader of the so-called Red Scare, a time when millions of Americans became convinced that communists had infiltrated every aspect of American life. Behind closed-door hearings, McCarthy bullied, lied, and smeared his way to power, destroying many careers and lives in the process. Prior to 1953, the Republican Party tolerated his antics because his attacks were directed against the Democratic administration of Harry S. Truman. When Republican Dwight D. Eisenhower entered the White House in 1953, however, McCarthy's recklessness and increasingly erratic behavior became unacceptable and the senator saw his clout slowly ebbing away. In a last-ditch effort to revitalize his anticommunist crusade, McCarthy made a crucial mistake. He charged in early 1954 that the U.S. Army was "soft" on communism. As Chairman of the Senate Government Operations Committee, McCarthy opened hearings into the Army.